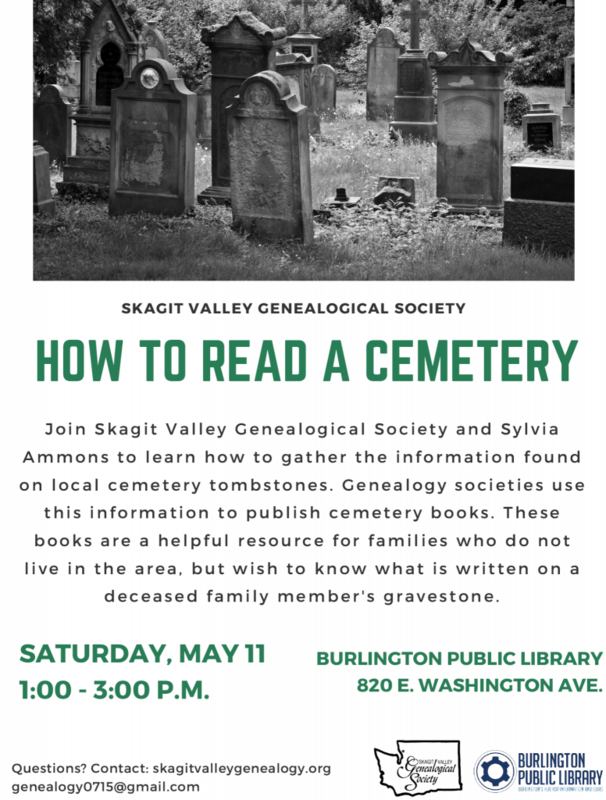 I’d like to let you know about an upcoming educational program we are offering on Saturday, May 11, 2019 from 1:00 p.m. until 3:00 p.m. in partnership with Skagit Valley Genealogical Society. The topic of the program is “How to Read a Cemetery” and will be presented by Sylvia Ammons. This event is free and open to the public. I’ve attached a flyer with more information. Please feel free to forward or post on any wall you wish! We appreciate your help in getting the word out, because we would like as many people as possible to benefit from our programs. Please contact me with any questions or feedback. Thank you for helping us spread the word about these free and valuable community resources. This entry was posted in Society News and tagged Skagit Valley Genealogical Society.